1. Pulse the biscuits in a food processor until fi nely crushed. Tip into a bowl and stir through the melted butter. Roughly line 6 x 8-9cm fl uted tart cases with a square of cling fi lm (large enough to hang over the edges). Divide the biscuit mix between the cases, pressing evenly and firmly with the back of a spoon. Chill for at least 2 hours or ideally overnight. 2. Use the cling film to ease the bases out, then discard the cling film. Spread the caramel sauce on top, then add all but 6 of the banana slices, dividing evenly between the pies. Whisk the cream and vanilla to soft peaks, then spoon a dollop onto each pie. 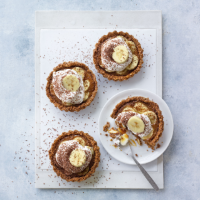 Finish each with a grating of dark chocolate and a reserved slice of banana. Serve immediately or chill until ready to eat (the pies will keep for up to 24 hours). If you don’t have time to make and chill the cases, pick up a pack of Waitrose 6 Sweet Pastry Cases instead.